Policeman Walter Kesterson was shot and killed by two suspects after he and his partner responded to a robbery call. Both suspects were shot and killed by Policeman Kesterson after he was shot. 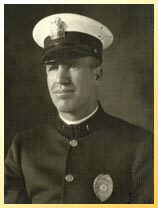 The two men were wanted for the January 31, 1946, murder of Officer Richard Pennington, of the Vernon Police Department. Officer Pennington was shot and killed after arresting the two men for leading him on a vehicle chase. Policeman Kesterson was posthumously awarded the department's Medal of Valor award in 2007.